Home » » In Haryana, you are punished if you fight corruption! In Haryana, you are punished if you fight corruption! Sanjiv Chaturvedi, an officer of Indian Forest Service in Haryana, has been forced to go on leave for unearthing several scams worth several cores in the forest department of the state. Gopal Krishna reports. 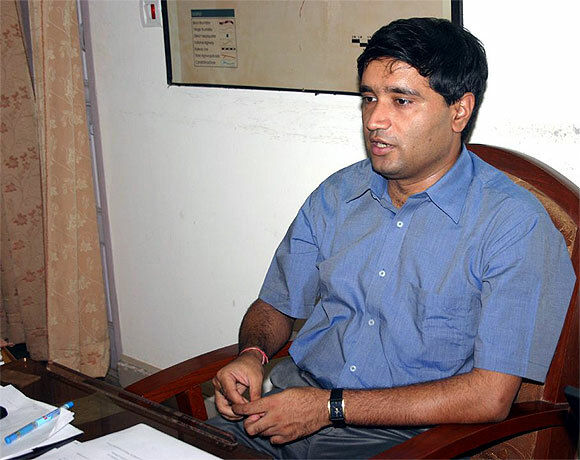 Sanjiv Chaturvedi, a Haryana cadre officer of Indian Forest Service, been forced to proceed on earned leave from June 3. Chaturvedi is a whistleblower who tried to resist and expose corruption in the Congress-led government in Haryana. It all started when Chaturvedi stopped the destruction of Saraswati wildlife sanctuary, Kurukshetra, at the hands of influential contractors of the state irrigation department in violation of Supreme Court orders and provisions of the forest and wildlife laws. The destruction would have happened due to construction of an irrigation canal through the sanctuary without statutory clearance. It is noteworthy that Haryana's share of forest cover is the lowest in the country. The Saraswati sanctuary is home to about 200 hog deer. It is believed that Saraswati, the mythical river, flows beneath the surface of the sanctuary. Chaturvedi has been fighting back while remaining within the system but it seems he is tired now. He has been forced to go on leave in spite of his work getting support from many quarters. are worthy of an independent probe by an investigating agency." Chaturvedi's allegations against the Bhupinder Singh Hooda-led government are worthy of investigations but still he has been transferred. Chaturvedi received a new appointment order on March 26, for the post of deputy secretary, All India Institute of Medical Sciences, New Delhi, with instruction for immediate relieving from Haryana. When Chaturvedi was not relieved, the Union ministry of environment and forests sent a telegram on May 7 to the state chief secretary for immediate relieving of the officer. This has not been complied with till date. The ministry sent yet another reminder on May 21, but the chief secretary still did not for relieve him. On May 31, secretary, Union ministry of health, wrote a DO letter to the chief secretary for immediate relieving of the officer in view of the urgent works to be undertaken at AIIMS as per the recommendation of a parliamentary committee despite this the Haryana government has chosen not to relieve Chaturvedi. Thus, the officer has chosen to go on leave. The Haryana government doesn't want to relieve him due to fear that once he goes out of the state he may speak out on the issue. From Kurukshetra, Chaturvedi was transferred to Fatehabad on May 30, 2007. Here Chaturvedi stopped the illegal expenditure of public funds, in creating private assets in the name of a herbal park on the private land of Prahlad Singh Gillakhera, an influential Congress politician, who was very close to then Haryana forest minister Kiran Chaudhary and is now chief parliamentary secretary, Haryana. The state government had proposed to build herbal parks for eco-preservation seven years ago. These plans have run into trouble. The government has been busy investing crores of rupees on private land in the village of the Congress leader although government land was available. Chaturvedi was placed under suspension by the Haryana chief minister without citing any reasons in the order on August 3, 2007. He was punished for resisting corruption. In April 2008, a voluntary organisation Ekta Parishad moved court in the herbal park case. In August, 2008 the Prime Minister's Office sought a reply in the matter from the state but Hooda government did not respond. The state government transferred the management of the private land to the forest department in February 2009 unmindful of the fact that transfer of management under Section 38 of the Indian Forest Act, 1972, does not affect ownership of the land. Continuing its harassment of this honest officer, the Haryana government issued a departmental charge-sheet to the officer for dismissal/removal from the service on September 14, 2007. In a major embarrassment, the suspension order of officer was revoked by the government of India on January 3, 2008. It passed severe strictures against the state government. Despite this, the Haryana government did not withdraw the chargesheet because then forest minister Choudhry returned the file for further comments which remained there till Choudhry was minister. After the November 2009 assembly polls, Captain Ajay Singh Yadav succeeded Choudhry as the state forest minister but nothing changed. An inquiry officer was appointed in May 2010 -- three years after the charge-sheet to ensure that Chaturvedi is not promoted, not sent on deputation or not even be allowed to quit the service at a time when his next promotion was due. Chaturvedi has been framed in concocted cases like stealing a Kachnar tree, abetment to suicide and he was referred to as a 'person of a dubious character' in the charge-sheet. After the suspension was lifted, Chaturvedi was put in a non-cadre post which was stayed by the Central Administrative Tribunal. He was finally posted as divisional forest officer, Jhajjar, in January 2009. Within one month in Jhajjar, he unearthed a fake plantation scam worth several crores. A charge-sheet was served on 40 forest staffers, and 10 were suspended. Suspecting involvement of senior officers, Chaturvedi insisted on a vigilance probe. Instead, the chief minister's office had him transferred to Hisar in August 2009. In Hisar, Chaturvedi unearthed yet another plantation scam and confronted his seniors by repeatedly seeking permission to initiate criminal proceedings for the embezzlement of public funds. In January 2010 when he sealed a large plywood unit that had in collusion with senior forest officers deposited Rs 26,000 instead of Rs 22 lakh as licence fee. The CMO responded by declaring his post vacant when he was away on official training in a foreign country for 18 days in March 2010. Chaturvedi reported about large scale embezzlement of government funds worth crores of rupees in the name of fake plantation, in Jhajjar division in February, 2009. On the orders of the state information commission, the office of principal secretary (forest), Haryana had to pay compensation to Chaturvedi and had to concede in writing that he was framed wrongly in a charge-sheet in April 2009. In August 2009, the officer was transferred abruptly from Jhajjar to Hisar (territorial) Division at the written direction of the chief minister, with the order being officer specific, clearly showed that he was being removed to soft-pedal the inquiry into the multi-crore plantation scam. In this scam, 40 field staff, including five range officers suspended/chargesheeted, on the report of Chaturvedi but no senior officer was touched. When his harassment continued, Chaturvedi submitted a detailed representation on August 16, 2010 to the cabinet secretary, government of India, about his harassment. This included 12 posting orders in five years, illegal suspension, false police cases, a fabricated charge-sheet kept pending for more than three years to deny promotion, deputation, etc. He reported about the corruption and violation of rules cases exposed by him. He made a submission to the President under Rule 25 of All India Services (Discipline & Appeal) Rules, 1969 as well on August 30, 2010. As a result a two member inquiry committee was constituted by the Union ministry of environment & forest on the directions of cabinet secretariat on September 15, 2010. The inquiry report of December 2010 found that the allegations made by Chaturvedi were true and recommended quashing of fabricated charge-sheet against him. The report recommended CBI inquiry into corruption/violation cases in view of the direction involvement of chief minister's office, certain ministers and senior bureaucrats including the younger sister of the then Haryana chief secretary. On January 9, 2011, based on the inquiry committee report, the departmental charge-sheet issued to the officer by the state government was quashed by the President. It was second such extraordinary intervention in just three years and perhaps the first case in the history of independent India when the President had to quash the charge-sheet, once again with severe strictures. It was observed that the officer was charge-sheeted for implementing the orders of Supreme Court and upholding the rule of law and that the charge-sheet was deliberately kept pending to block the promotion, deputation, etc. Earlier, the President has quashed the suspension of the officer. Thus, the Hooda government remains unashamed despite having been snubbed twice by presidential orders. When the charge-sheet was quashed, Chaturvedi applied for central deputation in January, 2011. His case was forwarded by the state government. Following this the Secretary, MoEF wrote a DO letter to chief secretary for protection of the officer and for sending his case for central deputation in September, 2011. .
Pursuant to MoEF reference, the CVC issued an advisory for protection of Chaturvedi and stopping his harassment on July 13, 2011 but no protection has been provided to him till date. On August 8, 2011, the CVC referred the case of Saraswati wildlife sanctuary to the CBI for opinion. The CBI found the case fit case for investigation on November 1, 2011. The CVC approved the CBI's opinion on December 16, 2011 and asked the MoEF to take up the issue of registration of the FIR and subsequent transfer of case to CBI. The MoEF asked the Haryana government to register an FIR on March 1, 2012 and issued the notification regarding the CBI investigation. The corruption cases are likely to involve Hooda's office, his cabinet colleague Choudhry and about a dozen IFS and IAS officers. Underlining Chaturvedi's growing stature as an anti-corruption crusader, he was invited by the prestigious National Police Academy, Hyderabad to address the IPS probationers and to act as a resource faculty on anti-corruption strategies on May 4, 2012. In the meanwhile, Minister for Department of Personnel and Training V Narayanasamy informed the PMO as per a confidential note dated on February 16, 2012 that Centre does not have jurisdiction to intervene in violations of central acts in states or to protect whistleblowers even if the officers belong to the all-India services. This note was cited by the Haryana forest minister in the state assembly on March 6, 2012 in its defence against a CBI probe ordered by the MoEF into the multi-crore forestry scams and violations of forest and wildlife laws in the state. The whistleblower, who has been facing harassment since 2007, has demanded a CBI probe. The MoEF and CVC have conceded merit in the demand and recommended a probe. There seems to be more than mere questionable legal wisdom behind the DoPT note that was leaked, found its way to the assembly, and ended up saving the day for the Hooda government. On March 7, when the state wrote to the MoEF arguing against the CBI probe, it defended its indefensible acts by using the legally and constitutionally questionable DoPT note to stall the imminent an CBI probe. Is it not quite obvious as to why is Hooda government is not relieving Chaturvedi to take up the central assignment? Revealing the current situation, the CVC asked the MOEF in March to update it about the actions being taken. MoEF in its reply of March 23 observed, "the action of the government was in the manner of regularising the violation, ex-post" and dismissed Hooda government's claim. Prior to Chaturvedi's move to go on leave in June, the PMO sought a report from MoEF on May 3 about the implementation of the recommendations of the two-member inquiry committee. Chaturvedi in a letter on June 9 to Ajit Seth, Union cabinet secretary wrote, "Because of the continuous harassment, victimization and witch hunting being faced for past five years not only my personal life has been devastated but it has also severely affected mental health of my aged parents ,who are residing alone in Lucknow, and finally, I had to proceed on leave from June 3,in view of my inability to sustain the torture unleashed on me. "Sir, this is the worst kind of witch-hunting and if the government of India is sincere to the words delivered in the above mentioned speech at civil services day, you are requested to immediately intervene to issue appropriate directions to the Haryana government for my relieving and to get entire episode enquired into by the CBI, as per the recommendations of CVC, to fix the accountability in this case." This officer's life and efforts appears to be in danger zone. Will it be too late before the CBI concludes its probe and the PMO wakes up from its slumber?